We recently took a very short weekend road trip to visit friends near Chicago. It was a fun trip – but so fast it felt like we were in the car more than we were with our friends! With that vast stretch of Iowa still looming between us and home, we made a quick stop for lunch on our return. We ordered mediocre Chinese from a food court. As our meal ended, the mood was gloomy. You could sense the reluctance to get back in this car where we’d spend the next 6 hours! My husband and I opened our fortune cookies. We read them aloud and laughed together; they were silly and nonsensical and unlikely to be true! These fortunes could in no way apply to our lives. Yet again – beautiful truth when least expected through the words of my child! Today is Palm Sunday, and we remember the triumphant entrance of Jesus into Jerusalem. At church this morning, we waved palm branches and cried Hosanna! The children sang songs of praise. Today we celebrate with shouts of joy for this Jesus who came to be King! With the celebratory moments of Palm Sunday behind us, we begin our walk through Holy Week. We remember the pain, the humiliation and the suffering our Lord endured. Yet through grief and darkness, we celebrate good news! For we KNOW the outcome of the events of this week. There is pain, and suffering and doubt; but through the death and resurrection of Jesus, there is life. And nothing can separate us from the love and mercy of our God! 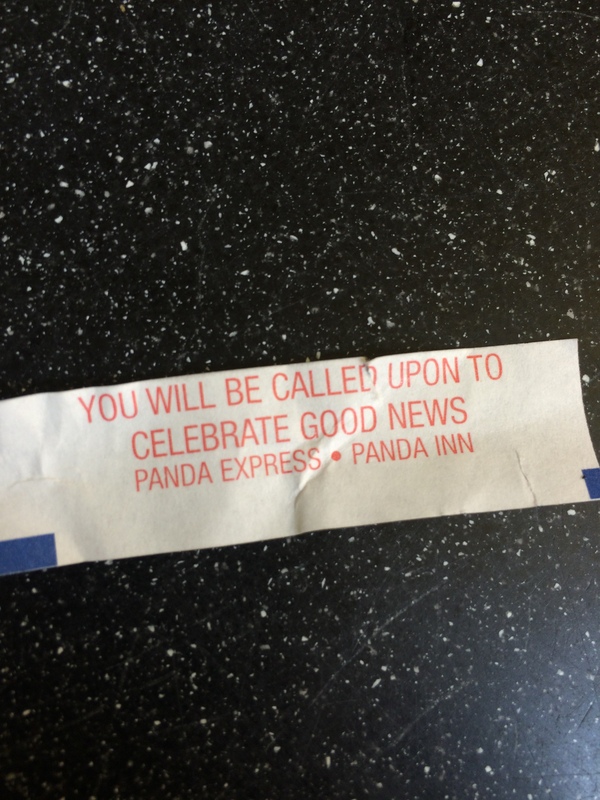 On a boring, uneventful day, with no plans for fun in the near future, my son hears there will be good news. How amazingly wonderful that his thoughts immediately turn to Jesus! Could it always be that simple? When faced with pain, fear and anger, we must remember our call to celebrate the good news of Jesus; we celebrate in our word and actions. Then we experience a love and peace found only in God’s presence. And that sounds like a reason to celebrate! Categories: Ministry | Tags: faith, fortune cookie, Holy Week, Hosanna, Jesus, pain, Palm Sunday, parenting, road trip, suffering | Permalink.